In July 2011 while vacationing 'downeast', I had occasion to visit the very well-known and Internationally acclaimed Acadian-scenes Painter/Artist, Claude T. Picard (and his wonderful wife, Jeanne). 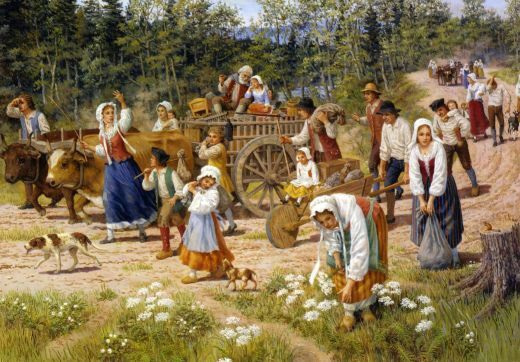 While he was nursing a sore foot at the time of my visit, Claude was in the midst of reproducing one of his famous 'Acadian-scene' paintings... at the ripe age of 79 years! Claude Picard was born in 1932 in Edmundston, New Brunswick. In 1946, when he was only 14, he won a national award in an artistic competition. He then undertook a three-year study trip in Europe from 1956-1959. 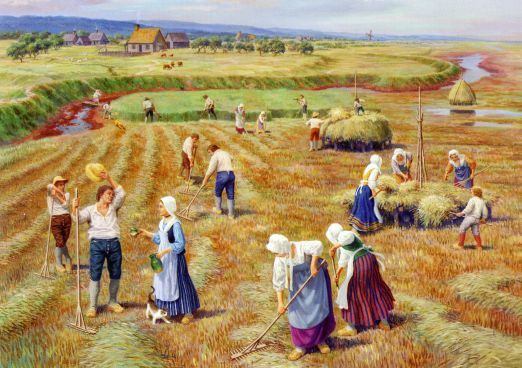 Mr. Picard depicts landscapes of his region, and also portraits, murals and historical paintings. Some of his portraits are at the Senate of Canada and the National Library of Canada in Ottawa, at the Legislative Assembly of New Brunswick in Fredericton, at the University of Moncton, and at the New Brunswick Museum in Saint John. 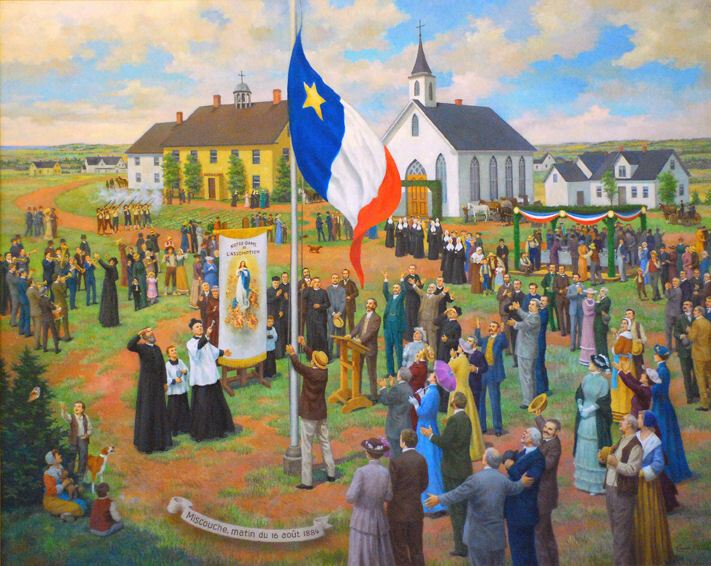 From an "Acadian perspective', Claude is undoubtedly best known for the six stunning historical scenes (best known as his 'Deportation Series') which he painted of the Grand Pré area for Parks Canada, each depicting typical Acadian scenes such as their harvest, their refusal to take the British oath, their imprisonment, the actual deportation, the burning of their houses and fields and their resettlement after the deportation. 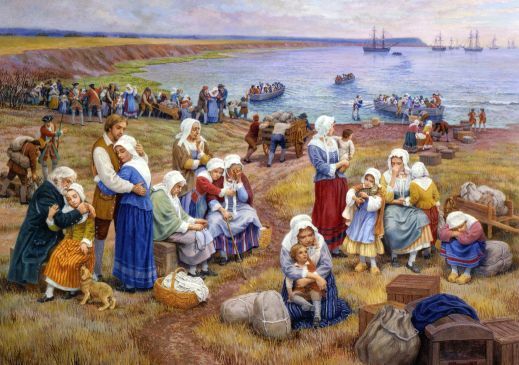 His painting 'Le départ vers lexile 1755 - Ships take Acadians into Exile-1755' is on the official First Day Cover of the 2005 Acadian Deportation Stamp, which was unveiled in Caraquet, N.B., by Canada Post. In 1992, he received the Commemorative Medal for the 125th Anniversary of Confederation (of Canada). 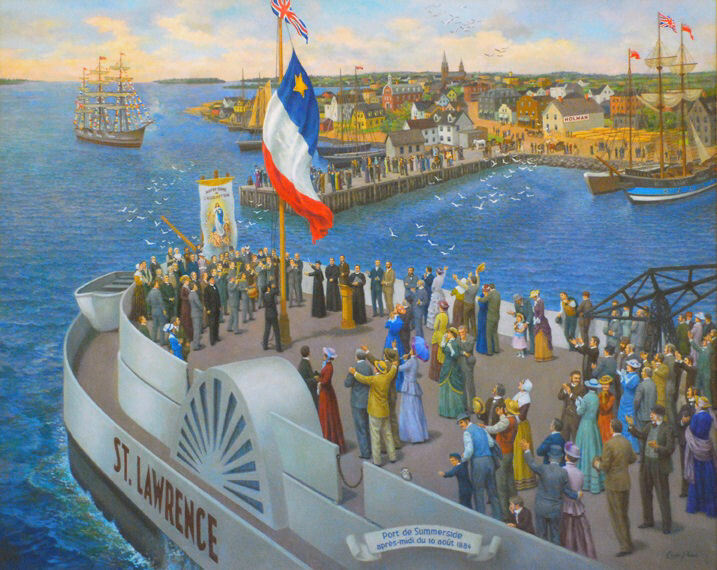 In 1990 he was awarded the Gold Professional Award by the Society of Graphic Designers of Canada for his paintings displayed on the historical map Acadie, lOdyssée dun peuple (Acadia, the Odyssey of a People). Canada Council grants were given to him in 1982 and 1992. In 1996, he received an Honorary Doctorate degree in Visual Arts from the University of Moncton. In 2004, he was named Personnalité Richelieu 2004 by the Edmundston Richelieu Club. The same year, he was chosen the winner of the Miller Brittain Award for his excellence in visual arts offered by the New Brunswick Arts Council. 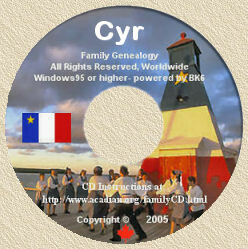 In 2005, Claude was awarded "La Petite Nyctale" by the Association du Musée acadien de lÎ.-P.-É. 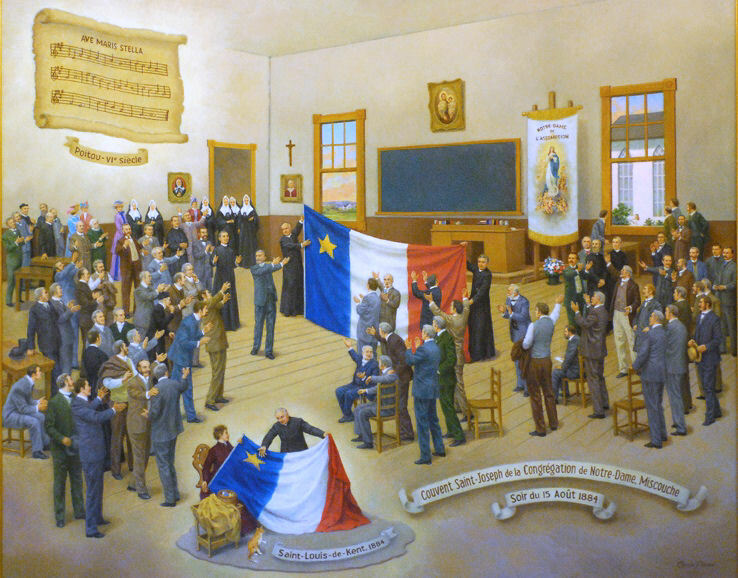 of Miscouche for his involvement in the Acadian cause and in recognition of the six large historical paintings titled 'Les grandes heures du peuple acadien - Momentous Landmarks of the Acadian People' (depicting the Acadian symbols), the originals of which are displayed at the Acadian Museum of Miscouche in P.E.I. In 2006, the Musée acadien de lÎ.-P.É. in Miscouche, P.E.I. named a room Galerie Claude Picard in his honour. Also in 2005, he was honoured by the City of Edmundston, N.B., for his involvement in promoting the arts. He received the Société Louis-Napoléon-Dugal Award for his contribution to the valorization of French and Acadian culture in the Madawaska region and was inducted into the Edmundston Arts Hall of Fame (TRAHF Edmundston). 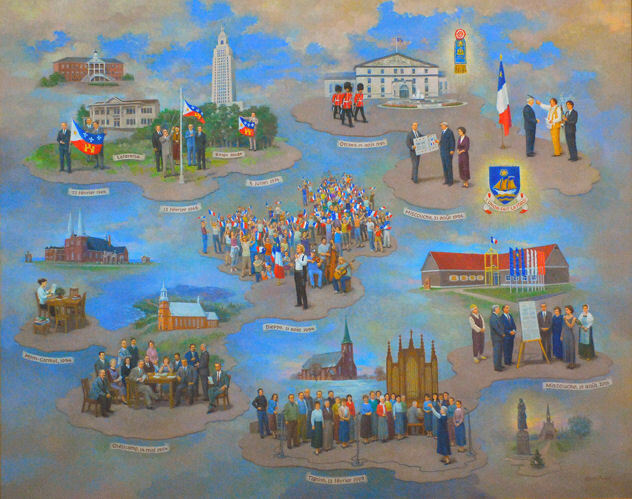 What is probably less known about Claude, is that the above mural was envisioned and completed in 1985 for the Madawaska Bicentennial. This historical mural pays homage to our pioneers, our settlers, our missionaries, our builders. It defines the altruism, sacrifice, courage, tenacity, loyalty and devotion to work of our ancestors. It is a brief retelling of the history of Madawaska, but this time through images. 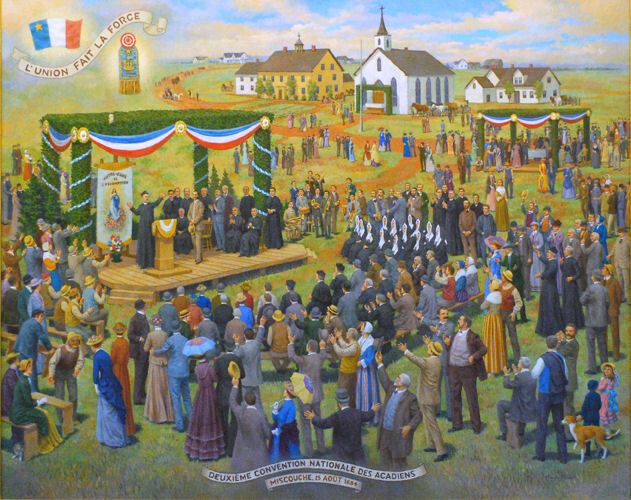 This mural, which measures approximately 2.1 m X 2.3 m (7' X 7 1/2`), is permanently displayed in the Municipal Council Chamber in Edmundston, New Brunswick. Before accomplishing this work of art, the artist Picard had to prepare numerous pencil drafts, sometimes calling upon a live model to capture the corporal expression of each character with the most accuracy possible. When his sketch satisfied him, he cut it out and added it to a collage where the other characters, laid out in small groups, seemed to balance each other in their relationships or with the work they were accomplishing. Once the composition was determined, he redrew the entire depiction and colored it with gouache to finish his draft. Last of all, he traced the contours with charcoal and painted the details with a brush, using the draft for inspiration: the project involving several months of work, not counting the weeks of preparation leading to the result. He was inspired by Thomas Alberts book, lHistoire du Madawaska, and articles published in the publication Revue de la Société historique du Madawaska. The artist wishes to thank Mgr. E. Lang, Mr. Oneil Clavet, Sr. Georgette Desjardins, Sr. Henriette Raymond and Mr. Conrad Soucy for their valued advice. 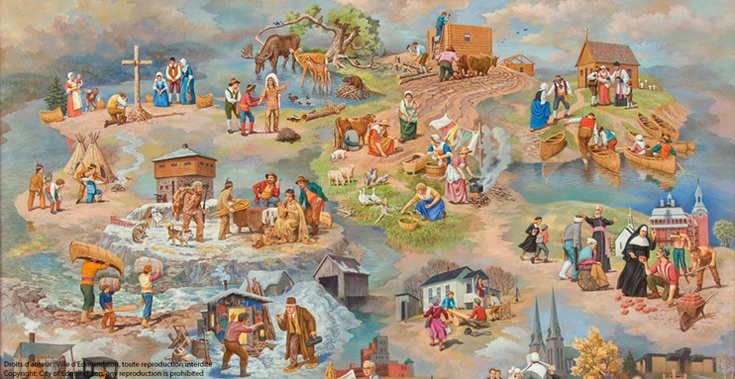 The whole of the tableau consists of 24 scenes which speak to us through an event or a given period of our history, through the trades or professions, through the buildings or companies, the world of commerce and leisure, the world of teachers or health care workers, religious life, flora, fauna, our traditions, our customs, our folklore and our land. Many other companies, characters or events could have been depicted, but it was impossible to put all in a mural of this kind.